The local family-run building firm consulted with Arbory Commissioners to develop the layout of the open space and play-park which are now accessible from neighbouring estates. Chairman of Arbory Commissioners Jane Glover said: "We feel happy the new areas will not only benefit the new residents of Cronk Cullyn, but that the facilities will also serve the wider community. "The original approved scheme didn't really offer a useable area of open space, but Hartford agreed to install a fully-equipped play park to achieve a much better, more usable provision. "They are also looking at how to improve the signage on the estate following a request from a resident." The play area has been named "Dwight's Park" in memory of the Australian sidecar racer Dwight Beare who died in the TT races. Dwight, who was a joiner by trade, had previously worked on the houses surrounding the park. James Greenhalgh, a director of Hartford Homes, said: "Typical open space provisions on new developments are just areas of soft landscaping but we felt that there could be a better layout for the site than that originally approved. "The result of working with the local Commissioners and planners is better public open spaces including a fully-equipped play area, better layout of housing and network connectivity for cyclist and pedestrians from surrounding estates." The Cronk Cullyn development, which is made up of 59 new homes including bungalows, terraced houses detached properties, was built and the majority of properties sold in less than two years. 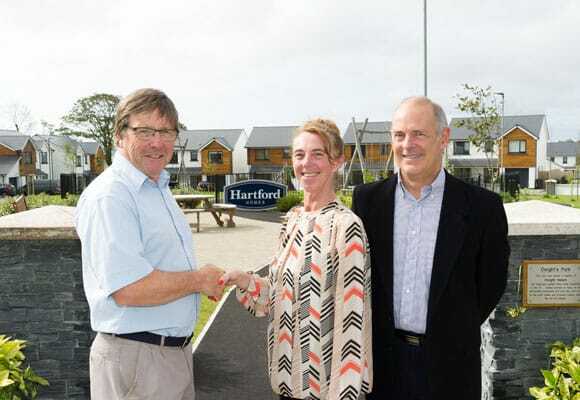 Photo Caption: Hartford Homes site manager Keith Featherstone hands over Cronk Cullyn park to chairman of Arbory Commissioners Jane Glover and commissioner Adrian Cowin.